4 a.m. in Shanghai. For the past couple of hours, I’ve been watching barges slink down the pitch dark HuangPu river right outside my hotel room window. Now, the sky begins to lighten, although this does not actually presage a visible sunrise, per se. The daytime Shanghainese sky is an unrelenting grey, “the color of television, tuned to a dead channel,” exactly like the famous opening lines of Neuromancer. And as I eyeball the sleeping city over the top of my laptop screen, all sooty multilane highways and skyscrapers, I imagine that different iterations of Case or the Finn might indeed be industriously hustling away in the Sprawl-like megalopolis out there. For the entire time that I have been here in Shanghai, I have yet to see a patch of blue sky. There’s a ceiling of industrial smog over the city. The last time I saw the sun was when our plane was making its final approach to PuDong Airport. Once we dipped below the smog layer, we entered this surreal twilight world. Any sunlight that manages to filter down through the thick layer of haze is diffused light, and there are no sharp shadows on the ground. The world, as viewed from behind a gauzy veil. Well, time to test how the air quality affects my lungs. I suit up and trot through the sleeping hotel, nodding at the night crew and the janitors industriously waxing the lobby floor. There’s something about the hours I keep; a sysadmin’s hours. Same as the janitors and plumbers and electricians. You may see us during the day, but our real work is done when the users are out of the office. Minimum disruption during off-hours downtime, baby! There’s a wonderful broad pedestrian walkway that runs along the length of the bund, right next to the river itself. No vehicular traffic and no stoplights the whole way. Perfect when you are running with music cranked up to the max on the iPod, and this sonic wall of post-punk means that you can’t hear car horns or even ambulance sirens. As a peppy number by the Killers kicks in over my earphones, I lope down the bund. There are a surprising number of people out for their morning constitutional at 4 a.m.. A number of older gentlemen are flying paper kites, catching the breeze off the river. One is a five foot tall paper affair with a bright orange tiger painted on one side, and I laugh inwardly because I remember a Chairman Mao quote, something about how all reactionaries are paper tigers. The kites overhead are dark shapes dotting the light grey sky, like a photo negative of a starry night sky. The air quality’s not the best, and it is humid as all get out, but I do not wheeze much. Try to keep pace with the barges that go up and down the river. Up close, I see that their cargo is coal and quarried stone, piles of it, heading south. Fancy touristy riverboats line the banks, neon lights switched off, dormant in the pre-dawn quiet. Utilitarian passenger ferries will begin chugging to and fro across the river in a couple of hours. For now, it is still and silent. 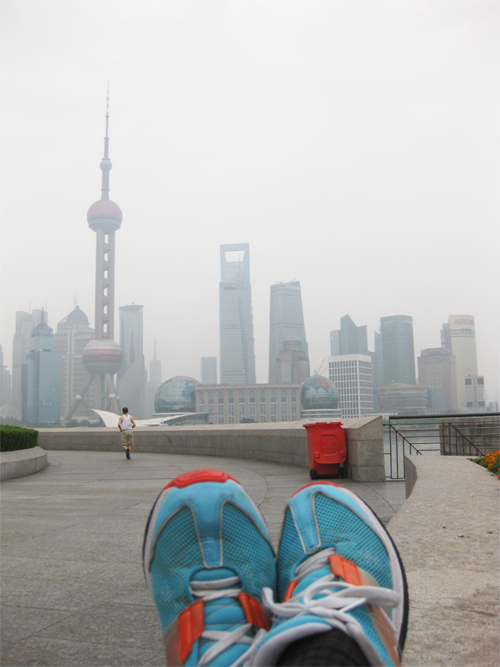 That famous Shanghai skyline stands out against the grey sky. The distinctive shapes of the Oriental Pearl tower and the Shanghai World Financial Center right across the river are mostly visible, but buildings in the middle distance become vague shapes, and skyscrapers further down the river completely disappear in the smog. Most of my fellow early birds look at me curiously as I pant past. That’s one thing about Shanghai, the unabashed staring at anything even slightly out of the ordinary. Very few people smile at strangers, though. It’s watchful, disengaged. So, for my own entertainment, I grin at anyone who makes eye contact because it seems to surprise everyone and almost nobody seem to know how to respond. There’s this split second of “Wait, who are you smiling at? Surely not me?” It is the complete opposite of the Caribbean where you say Good Morning and Good Afternoon to everyone you pass on the street and it is not unusual to offer up a general greeting when you walk into any room. Corner store, post office, workplace, any roomful of strangers. Several of the less easily surprised kite fliers smile and wave back. Maybe public introversion is simply urban self-preservation. Don’t let anyone get subcutaneous until they pass the sniff test. You have to insulate yourself more in high-density population centers; resent the frequent intrusions into your personal space; keep the crazies at bay with a disengaged persona. Like the weird jogger who grins madly at everyone. People are strange when you’re a stranger.